There are several points of interest along this route, with most of the really good photo opportunities featuring at the start and midpoints of the walk. You will initially pass through Balloch Country Park, the only park around Loch Lomond, which is home to the impressive Balloch Castle. The park itself covers over 200 acres and offers superb views of Loch Lomond and the surrounding countryside, and there will probably be a temptation to forget about the John Muir Way and concentrate on the park instead! Moving further on you will enter the wilderness of the Dunbartonshire countryside and eventually begin your ascent into the Kilpatrick Hills. This hill-range is probably the highlight of the walk, with amazing panoramic views of the Trossachs and the deep wilderness of Dunbartonshire visible in all directions. In fact, it’s all too easy to forget you’re only 10 miles outside of Glasgow, but the ascent will allow you to view the city and the famous River Clyde if the weather is clear enough. The end destination is the village of Strathblane in Stirlingshire, which will allow you to have a rest and take in some refreshments before either heading back to Balloch or continuing on with the next section of the John Muir Way. John Muir was a naturalist and conservationist who was born in Scotland in the 19th-century, and throughout his career he dedicated his life to preserving many of the wilderness areas in the United States – including Yosemite Valley and the Sequoia National Park – after developing a fascination with the East Lothian countryside. 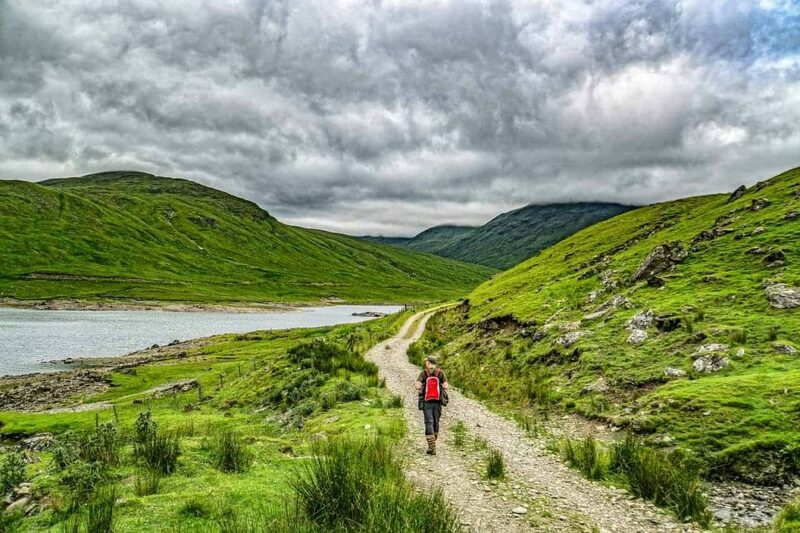 The John Muir Way is a beautiful trail created in his honour that runs through central Scotland for over 134 miles on a path that takes walkers across some of the most beautiful parts of Scotland. Over mile after mile of scenic countryside you’ll discover rivers, beaches, canals, lochs and iconic hills between Helensburgh on the west coast and Dunbar on the east coast. The entire route is well maintained but some sections are unsuitable for buggies and wheelchairs, but even so many sections feature accessible paths that allow anyone to get outside and enjoy this lovely part of Scotland’s lowland countryside. The entire route can be either walked or cycled end to end but it’s probably best to break it down into separate sections and complete each one over the course of several days. Rather handily, the John Muir Way website has taken care of this for you and has downloadable maps so you can follow each route at your leisure. You’ll find a guide to the first section of the route – Helensburgh to Balloch – here. The walk from Balloch to Strathblane is around 18 miles and will take walkers of average fitness levels around 6 to 7 hours to complete. Easy-medium difficulty. There are a mixture of forestry tracks, public roads and stone paths on this route, with some steep sections in places, especially as you get into the hills. Note that in winter the natural sections of pathways through the Kilpatrick Hills can get very muddy. From the centre of Balloch, follow the path into the country park and around the castle until you reach signs pointing towards Mollanbowie Road. Follow the public footpath east towards Stirling Road, and once at the junction head north until you see signs for Auchincarroch Road. The footpath here will take you towards the Kilpatrick Hills, and there are intermittent signposts to keep you on the John Muir Way once you enter the natural-made sections of pathways. You will eventually reach Burncrooks Reservoir which you can follow around until you get on the minor road heading towards the small village of Carbeth. Continue heading east along the various man-made tracks and natural paths until you reach Carbeth, and then head north along the A809 a short way until you reach the next section of off-road path which will eventually take you past Carbeth Loch. Join the West Highland Way as it continues north, before finally walking the last section of the track taking you to Strathblane. The John Muir Way is open 24/7, 365 days a year. There is no fee to walk the John Muir Way.